The Crime of the New Century, 1903. 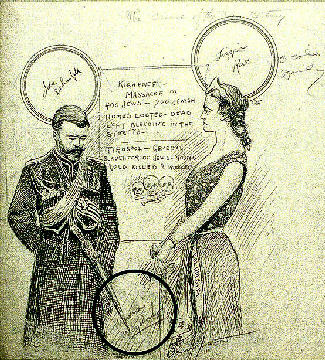 This is a drawing depicting Czar Nicholas II and Lady Columbia. She appears to be scolding him, and he averts his eyes in apparent embarrassment. 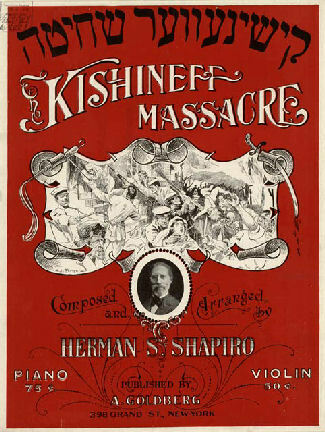 There is a poster with several skulls and bones behind them that reads "Kishenev Massacre of 400 Jews--700 Jewish Homes Looted --Dead Left Bleeding in the Streets. Tiraspol--General Slaughter of Jews--Young and Old Killed and Wounded." New York: Asna Goldberg, 1904. 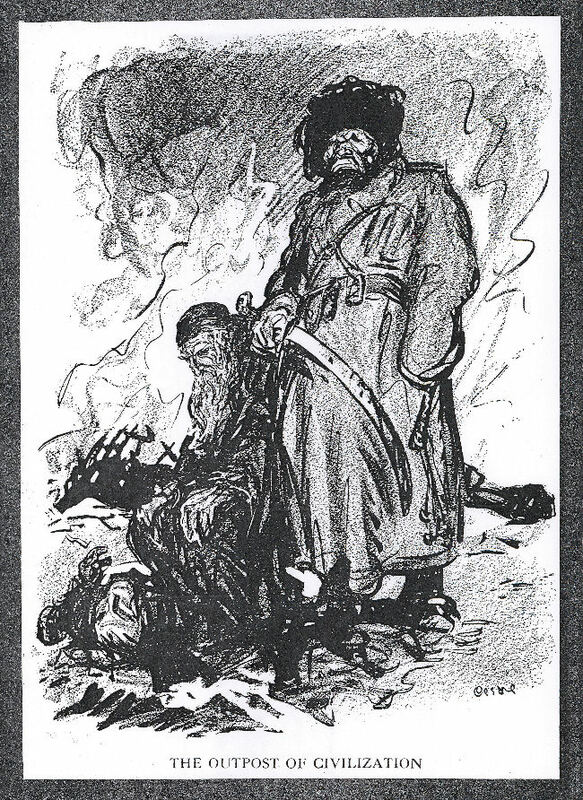 The illustration in the center of this elegy depicts the April 1903 Kishinev massacre. 723 Lexington Avenue, New York, N.Y. I have received at the hands of the Honorable Simon Wolf, your letter of the 5th of October. He has also delivered to me the sound copy of the Kishineff Petition. It gives me pleasure to accept the charge of this important and significant document, and to assign it a place in the archives of the Department of State. Although this copy of your Petition did not reach the high destination for which it was intended, its words have attained a world-wide publicity, and have found a lodgement in many thousands of minds. 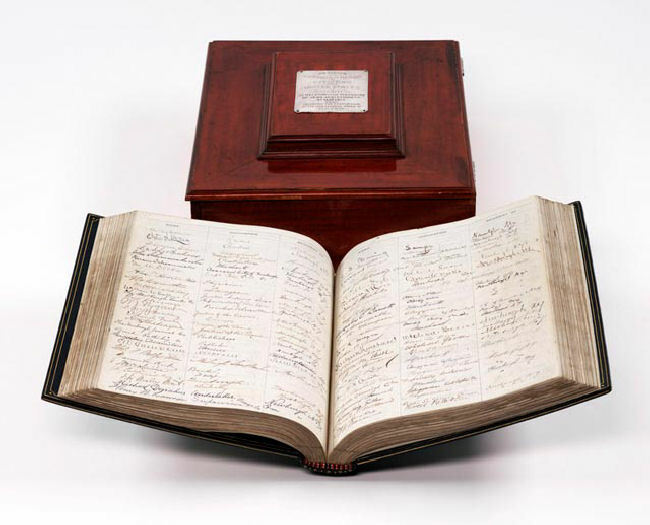 This Petition will be always memorable, not only for what it contains, but also for the number and weight of the signatures attached to it, embracing some of the most eminent names of our generation of men renowned for intelligence, philanthropy and public spirit. In future, when the students of history come to peruse this document, they will wonder how the petitioners, moved to profound indignation by intolerable wrongs perpetrated on the innocent and helpless, should have expressed themselves in language as earnest and eloquent and yet so dignified, so moderate and so decorous. It is a valuable addition to public literature, and it will be sacredly cherished among the treasures of this Department. Letter above is courtesy of the Philip and Mildred Lax Archive of B'nai B'rith. Stop Your Cruel Oppression of the Jews, 1904. Ben and Beatrice Goldstein Foundation Collection. 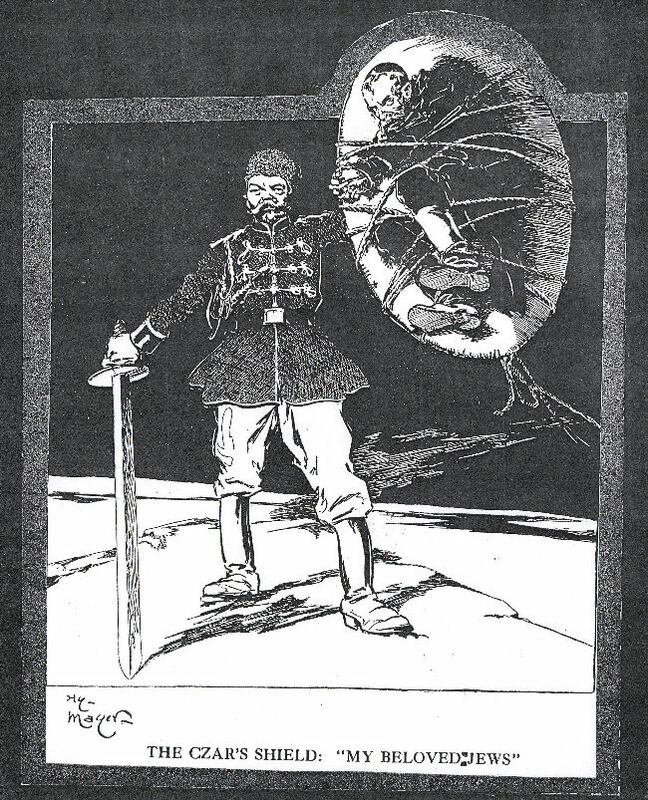 The print above was produced after one of the Kishinev pogroms. 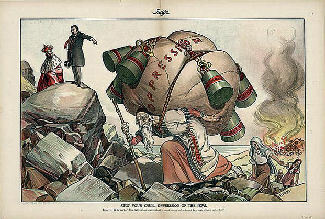 Depicted in this print is an old Russian Jew, whose is carrying the burden of oppression on his back, weighted down by "autocracy," "robbery," "cruelty," "assassination," "deception," and "murder." In the background on the right a town filled with Jews burn. On the left, U.S. President Teddy Roosevelt poses the question to the then Emperor of Russia, Czar Nicholas II, "Now that you have peace without, why not remove his burden and have peace within your borders?" Many writers spoke out about the violence in Kishinev. Articles and plays were written about it. Elegies, such as the one mentioned above, were composed in memory of the violence that had occcurred. There were two pogroms in Kishinev (now called Chisinau, located in the country of Moldova). The first one, on 6-7 Apr 1903, was said to have begun because of the rumors that were spread that Jews were involved in the murder of a Christian Russian boy two months earlier. Two anti-Semitic newspapers published these rumors, one going as far as saying that the Jews killed the boy so they could use his blood to make matzoh. This was an age-old accusation made of the Jewish people. The second pogrom took place on 19-20 Oct 1905. The violence against the Jews in Kishinev occurred during political protests against Nicholas II. These two pogroms became a symbol of the inability of the Jews to defend themselves in a world that was hostile to them. This compelled many Jews to emigrate from Russia for other lands such as those countries in the West and Palestine.